checkSTRESS is a standalone application that enables a piping designer to perform a preliminary check on pipe stresses during an initial design before submitting the layout for detailed stress analysis. 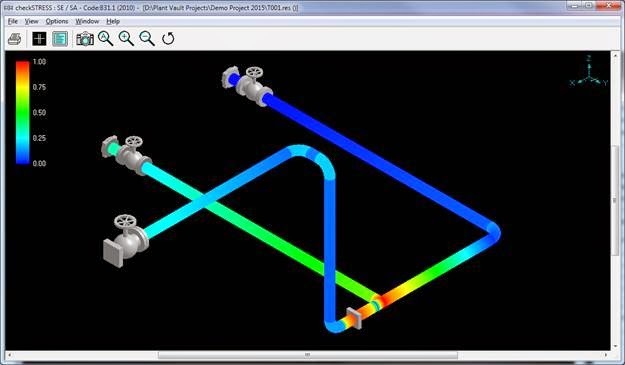 Using checkSTRESS together with AutoCAD Plant 3D, a piping designer can quickly and easily create a “Code Compliant” piping layout by simply reviewing a colour-coded model of his piping deisgn. checkSTRESS is able to take a standard PCF file as input and from that re-construct a 3D piping model and calculate the relative stresses due to expansion, weight and pressure which it uses as a key to colour-code the model.